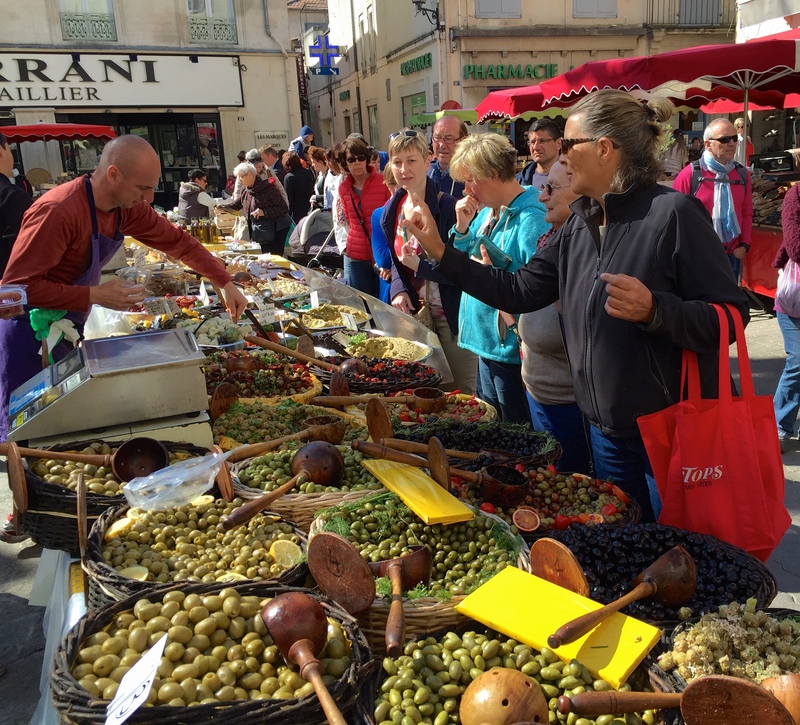 After Peter Mayle wrote A Year in Provence in 1989, Francophiles the world over yearned to relive his experiences enjoying the excellent markets, fascinating people, and delicious food of Provence. So here we are. Nous sommes ici! Our home base for a week or so is Saint-Rémy-de-Provence, a quiet little town south of Avignon, north of Arles, east of Nimes, and west of Peter Mayle’s Ménerbes location. A perfect spot! It was van Gogh’s home for a year (more on that later). As with every town we’ve visited in France, it has a Centre Ville, generally including a large church. On any other day, the parking lot across from the church is full of cars, but on Wednesday, any remaining cars are towed away to make room for the market, quite a big one, full of colors, sights, sounds, and smells that are truly Provençal. This is partly a farmers market and so much more. Here you can buy fashionable clothes and all kinds of kitchen linens. We loved the colorful serving dishes. 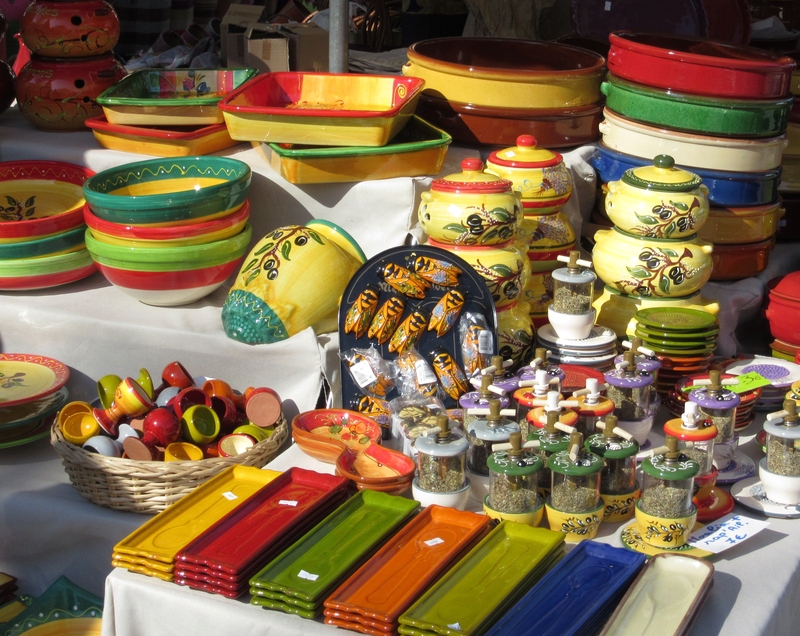 Lavender, olives, and cicadas are common decorations on the colorful dishware. With limited room in our suitcases, we bypassed the clothing and moved on to consumables. So much to choose from. 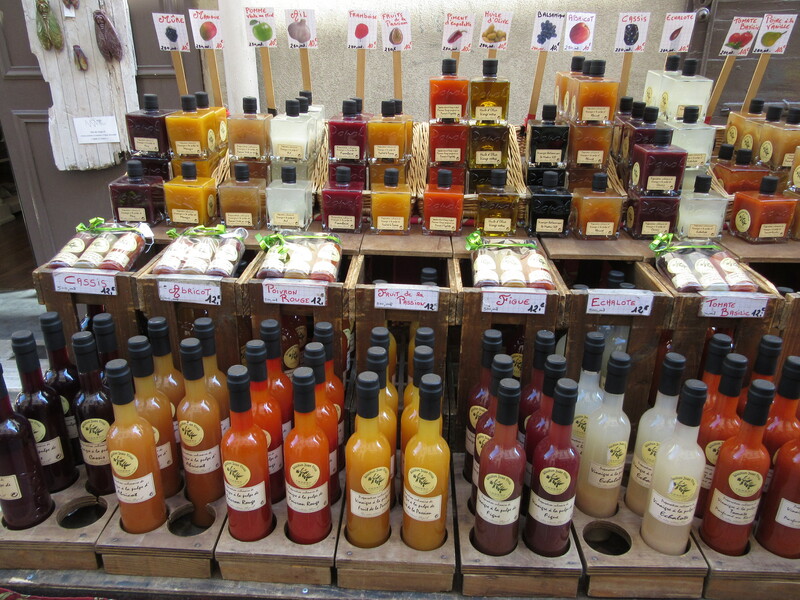 Twenty flavors of vinegar. We bought passion fruit…and hope it survives the trip home! These are all different curry and chili powders. 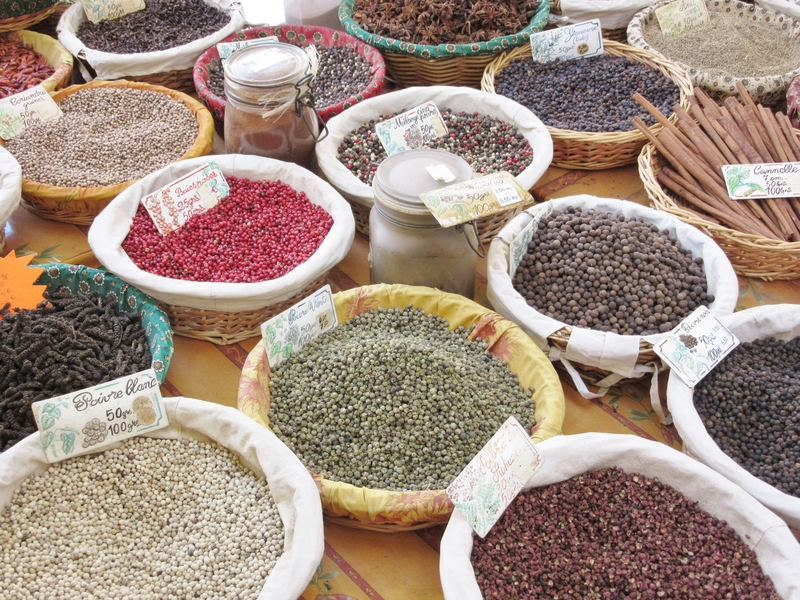 And just as many varieties of beans and lentils. Then come the sausages and cheeses. Notice the “gouts” on the counter. 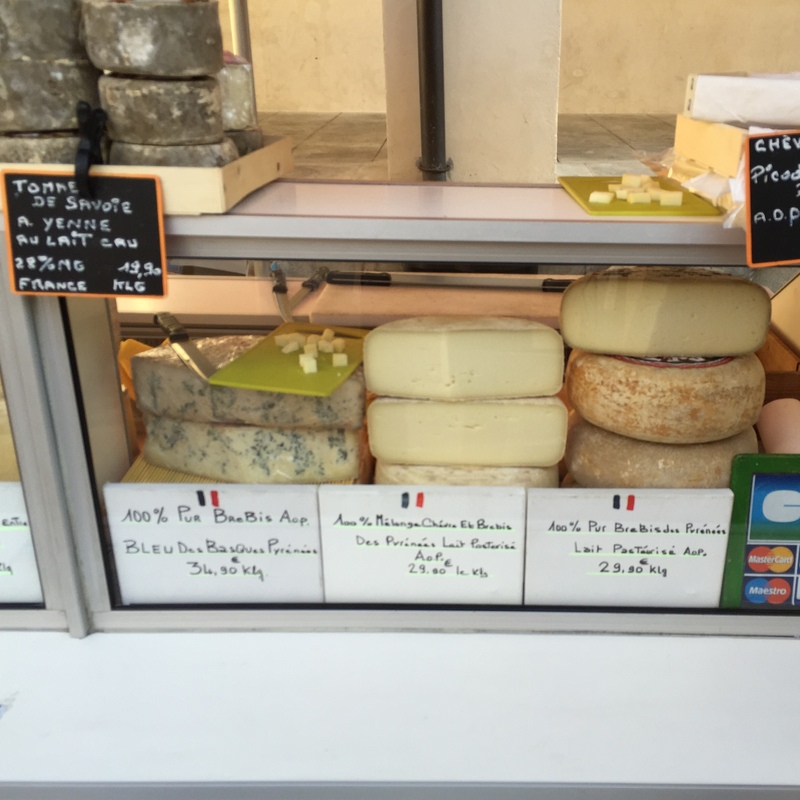 Sample every cheese and then make a purchase. And olives! 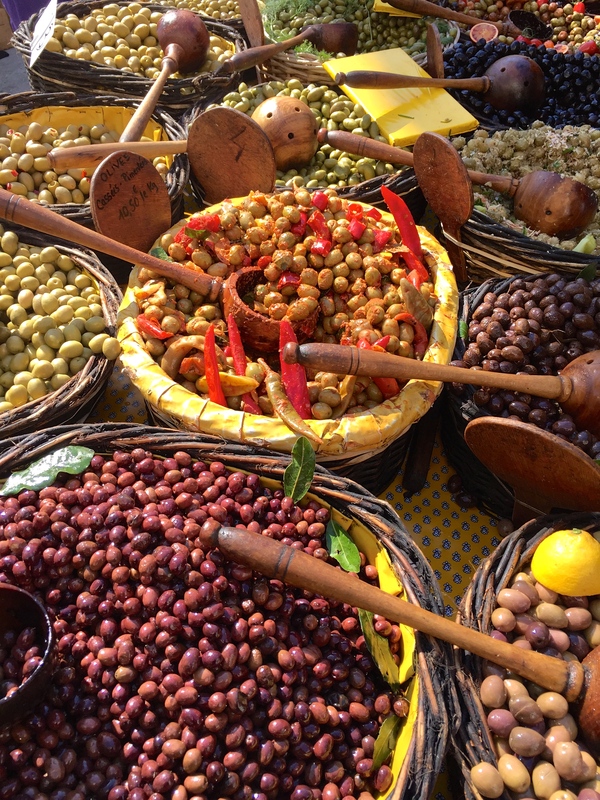 The most popular stand in the market has a dozen types of olives, many tapenades and other preserved items, and buyers three layers deep. Note the Americaine with the Tops grocery bag at the olive stand. So many olives, so hard to choose! Solution: Buy a bit of each. The fresh produce looks mouthwatering and tastes delicious. Many vendors offer samples! 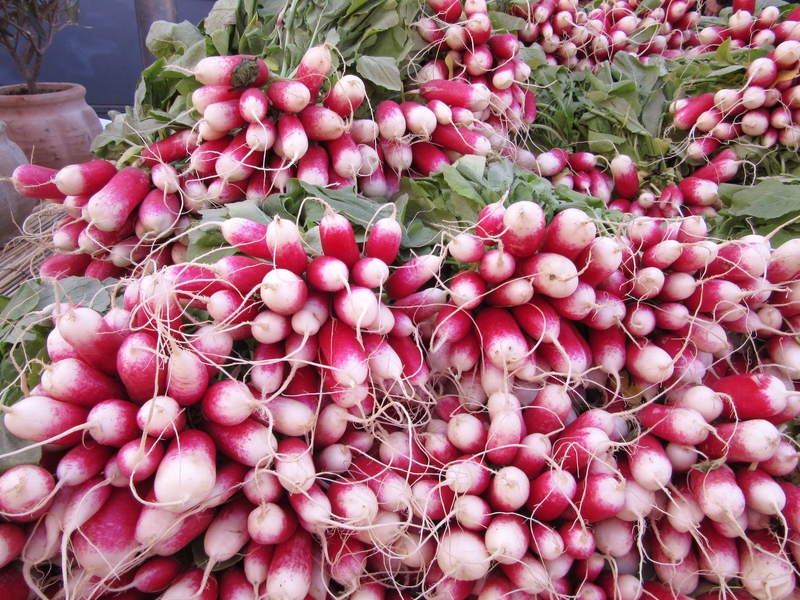 One Euro for a bunch of radishes, delicate and almost sweet. 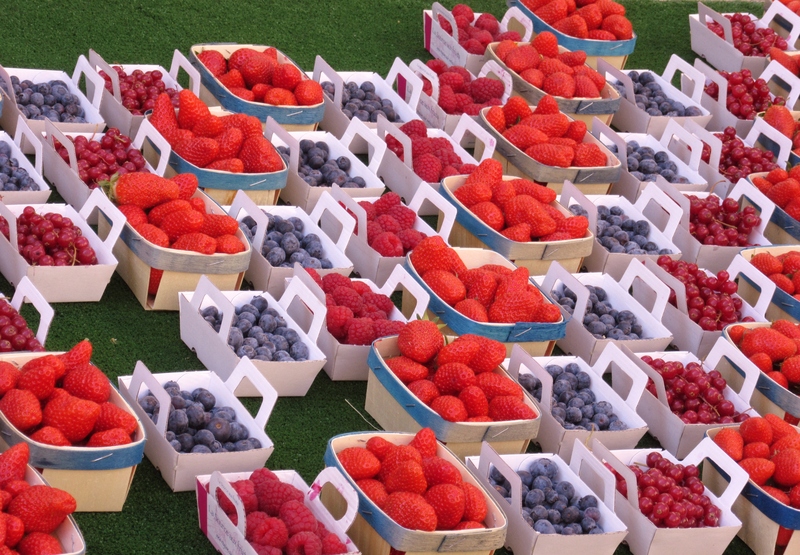 Who could resist these fresh berries? 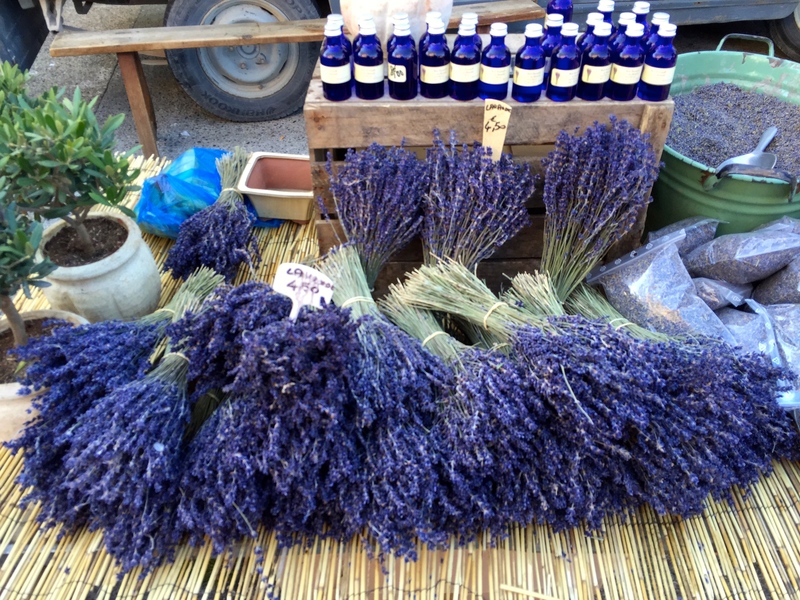 Finally because it’s Provence, the market has lavender. Not in season yet this year, but with lovely aroma and promise of color in the fields later in the spring. After the morning market, it was time to pick up a baguette from the boulanger near our apartment and head home to make a gourmet lunch of cheese, sausage, olives, more olives, and radishes. 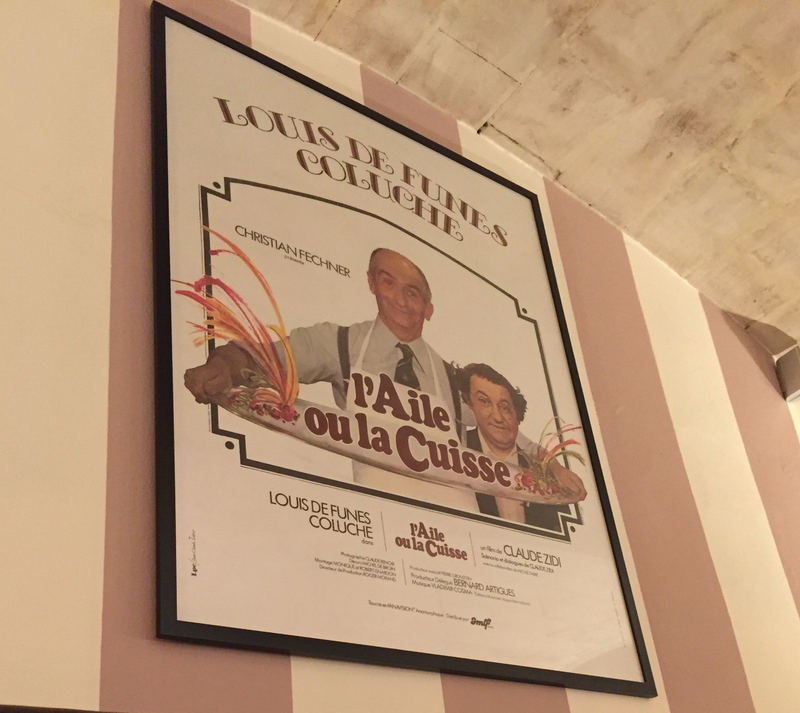 In the evening, we sampled the gastronomy at a local restaurant, L’aile ou la cuisse. (By the way, the gastronomic meal of the French is on UNESCO’s Representative List of the Intangible Cultural Heritage of Humanity.) The restaurant name means “the wing or the thigh” and it’s also the name of a French comedy from 1976 about a food critic who has lost his sense of taste. Fortunately we haven’t lost our sense of taste! We enjoyed our meals immensely. 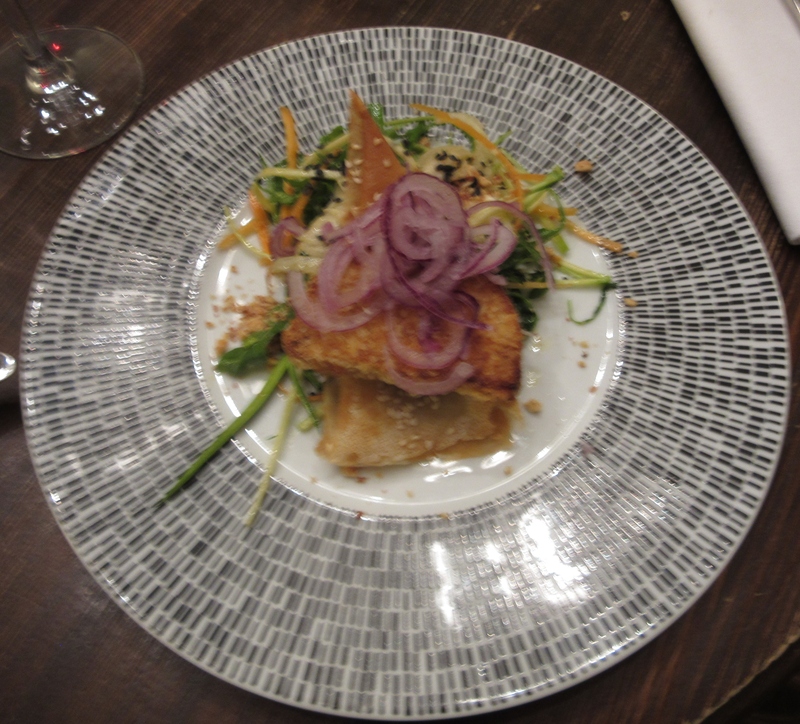 The entree (which is the appetizer, not the main) we chose was breaded and lightly sauteed goat cheese on salad. One of the best salads ever! 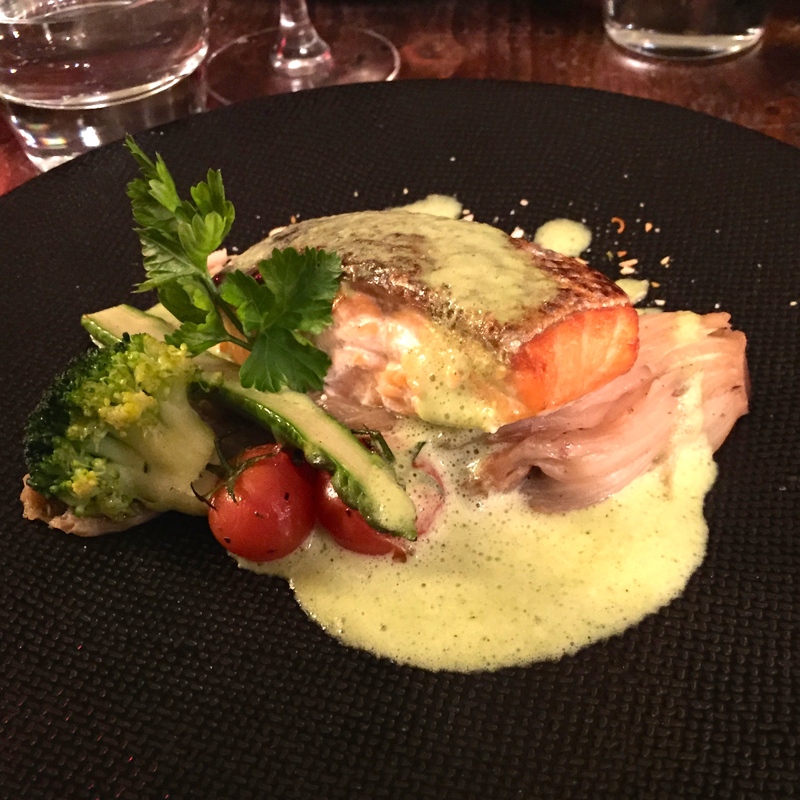 Michael’s salmon was cooked to perfection with a vegetable he loved but couldn’t identify. We think it was endive. Nancy’s filet du cochon was likewise delicious. We weren’t sure what cochon was and the waitress explained it by demonstrating a snorting animal. A pig! For dessert we were invited to visit the patisserie at the front of the restaurant to select our pastries. This was recommended as “Number One,” the most popular dessert. 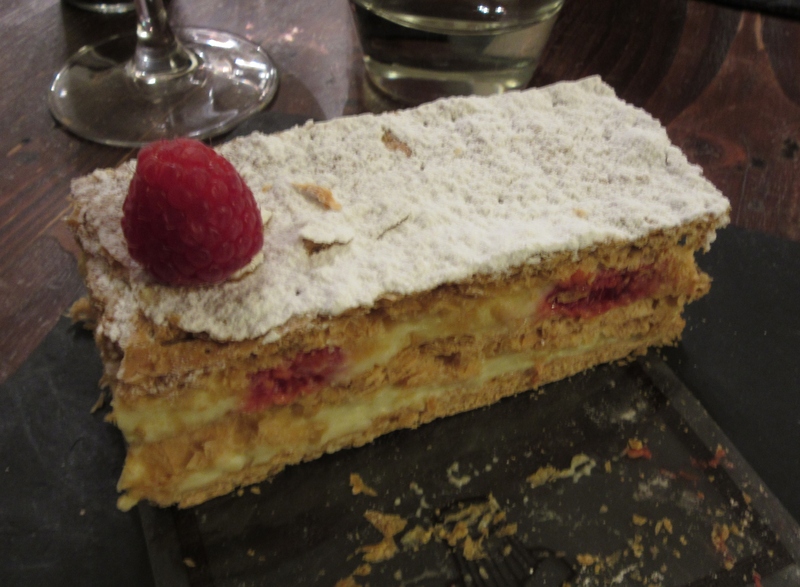 The light cream, crispy pastry, and fresh raspberries explained its popularity. Inside is chocolate brownie and the best chocolate mousse ever, covered with a very dark chocolate ganache. 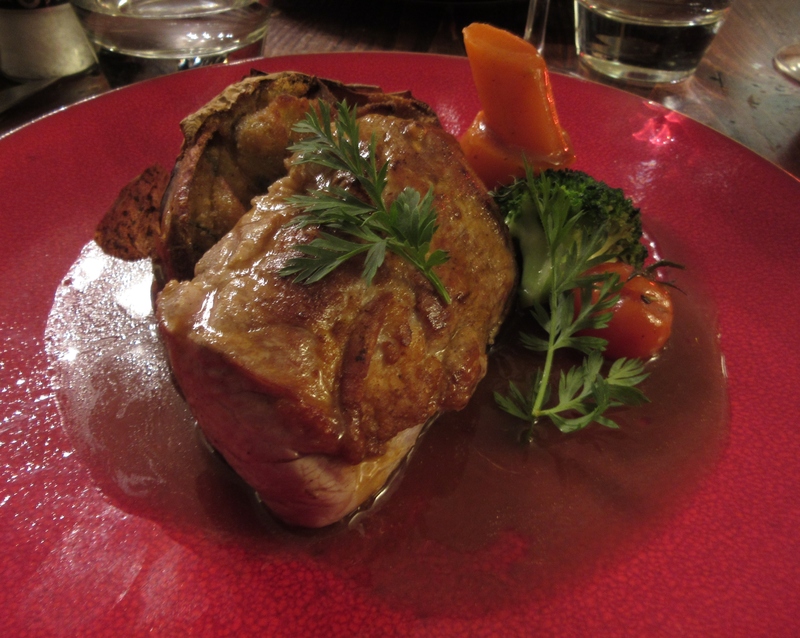 With a nice bottle of French rosé wine, the meal was perfect, one of our best in France. We could easily stay in Saint-Rémy-de-Provence for a very long time. A year, in fact, would be great. 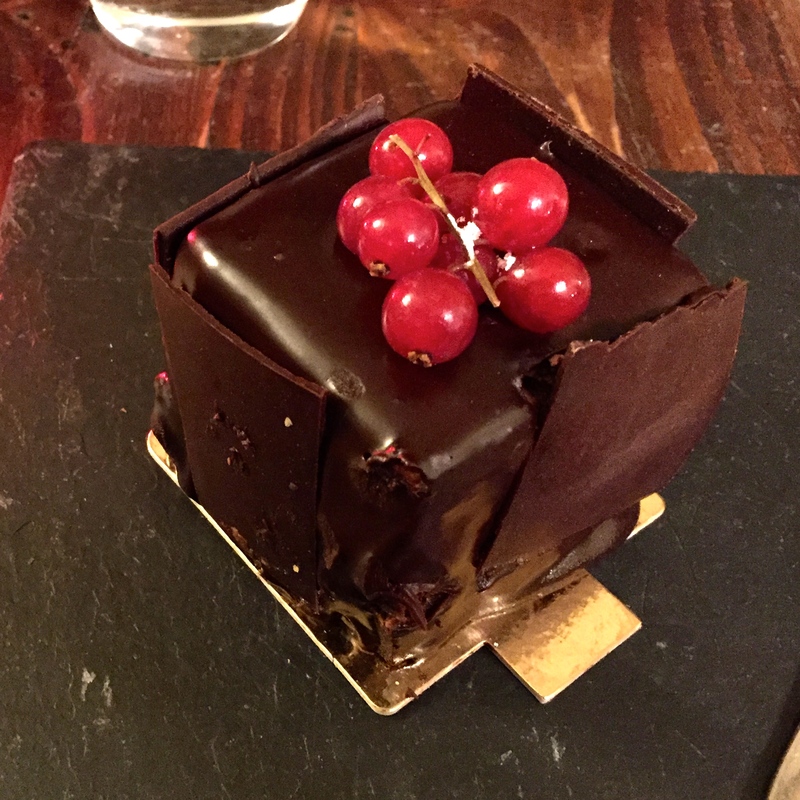 This entry was posted in Smell the Roses and tagged A Year in Provence, chocolate, France, French gastronomy, L'aile ou la cuisse, market, Saint-Remy-de-Provence. Bookmark the permalink. The pig snort reminds me of when Brooke and I were eating a delicacy in a small town in Ecuador that we couldn’t identify. Finally, we realized the horror of what we were eating, when I sounded out, “Baaaa?” Sheep’s blood soup!!! Did it at least taste good? It seems anything here becomes quite flavorful with a good sauce.